Working as an intensive care or critical care nurse requires expert technical skill and an innate ability to deal with stress during a crisis. These highly skilled, experienced registered nurses (RNs) are the crucial liaison between the critically ill patient for whom they are caring, the team of physicians caring for the patient and the over-stressed family members. In most hospitals, Critical Care or Intensive Care Units (ICU) are highly specialized because they focus on specific conditions or types of patients. While the generic unit names are interchangeable, there are often separate units which offer intensive care to a well-defined patient population, such as a Neonatal Intensive Care Unit (NICU) where newborns needing specialized care are treated or a Surgical Intensive Care Unit (SICU) for patients who have suffered trauma or had complicated surgery. Critical Care Unit specialties vary from hospital to hospital, depending upon the services offered at each facility. The focus of an ICU is to deliver high intensity medical care with a low nurse to patient ratio, often 1-to-1. The care is highly skilled, given the complicated equipment and medication regimes used. The staff constantly controls and assesses the critically ill patient, who is often in a state of unconsciousness due to their illness or medication induced. The goal of the ICU staff is to get the patient medically stable and transferred to a unit where their recovery and rehabilitation will continue. The ultimate nursing goal is for the patient to be discharged to a medical rehabilitation facility or home for further recovery. The main responsibility of the Critical Care Unit staff is to support the patient, physically and emotionally, as they navigate a critical illness. They also have a responsibility to keep the attending physicians updated about any changes in the patient's condition so the parameters of care can be adjusted. Keeping the family informed and offering them emotional support are key duties of the ICU nurse. Who is treated in an Intensive or Critical Care Unit? The patient population in any Intensive Care Unit, regardless of specialty, is critically ill and warrants constant physical support by the staff. The complex medical equipment requires highly skilled healthcare providers with expertise in hemodynamic and cardiac monitoring, ventilators and other advanced life support equipment. General patient conditions that necessitate admission to a Critical Care Unit are those who have suffered a life-threatening trauma, had complicated surgery or suffer from a complex medical condition. Specifically, head trauma, open-heart surgery, colon perforation, aneurysm repair and similar conditions are treated in respective intensive care units. What is the Work Environment Like in the ICU/Critical Care Unit? The ICU offers a variety of sensory stimuli for both the patient and the staff. Mechanical sounds and stimulation from the machines, the sights and sounds of incapacitated patients, bodily secretions and distressed family members add to the routine Critical Care Unit environment. The unit functions 24 hours a day at full capacity. The majority of units revolve around 12-hour work shifts, either 7 AM to 7 PM or 7 PM to 7 AM. Many units offer a 36-hour workweek consisting of three 12-hour shifts while others maintain coverage with two 12-hour shifts and two 8-hour shifts for a 40-hour workweek. The 36-hour workweek allows the highly stressed staff to enjoy sufficient downtime in order to recharge their persona before the next shift. The aforementioned stress originates in the constantly changing patient population and rapidly changing medical conditions. Emergencies are routine in the Critical Care Unit. What Kind of Training is Needed to Work in the ICU/Critical Care Unit? There are over 500,000 critical care nurses working in the United States of which nearly 230,000 are RNs in hospital-based Intensive or Critical Care Units. The remaining RNs practice in intensive care units, emergency rooms, post anesthesia units (PACU) and transitional care units where patients are often transferred after spending time in an ICU. 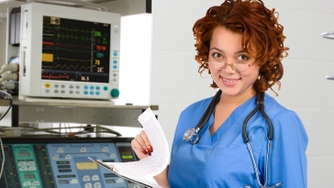 The basic requirement to work in a Critical Care Unit in most hospitals is to be a licensed RN with a minimum of a BSN. The American Association of Critical Care Nurses (CCRN) offers nationally recognized certification as a critical care nurse. The certification exam can be taken after a critical care nurse cares for critically ill patients for a minimum of 2 years. The certification is offered in several different specialties such as cardiac surgery (CSC) or cardiac medicine (CMC). In addition to a nursing degree, in-service education and on-the-job mentoring provide crucial and current information to enhance nursing practice and patient care. What Does the Critical Care Unit Staff Do? Critical Care Nurse: Critically ill patients dealing with life-threatening health issues are cared for and families members are supported by this BSN prepared RN. ICU Nurse Manager: This Nurse Manager holds a minimum of a BSN. In addition to supervising the unit staff, managing the budget and the general operation of the department, this manager offers a strong support system to a high stress staff. PICU Nurse: These Pediatric Intensive Care Unit RNs are at least BSN prepared and care for critically ill infants, children and teenagers. NICU Nurse: This BSN prepared RN works in the Neonatal Intensive Care Unit and cares for babies who are born prematurely, are born with or develop health problems during delivery or experience health issues while still hospitalized. Neonatologist: This hospital-based physician works in the pediatric subspecialty that cares for newborn infants, especially those who are in the NICU. Trauma Surgeon: This board certified physician surgically treats SICU patients who have suffered life-threatening trauma, usually involving multiple organ injuries. They provide the initial critical care and follow through with management of the case. Anesthesiologist: A board certified physician in anesthesia is an important healthcare provider in an ICU where patients are often on a ventilator and require continuous sedation. This MD also oversees patients immediately before and after critical care surgery while they recover from anesthesia. SICU Nurse: Working in the Surgical Intensive Care Unit, this BSN prepared RN cares for critically ill surgical and trauma patients. CCU Nurse: Coronary Care Unit nurses care for patients who have suffered a myocardial infarction (heat attack) or other coronary event that requires close monitoring. This RN is BSN prepared. MICU Nurse: The Medical Intensive Care Unit nurse, who has earned a BSN, cares for patients with a variety of medical issues such as pneumonia, drug overdose, GI bleeding, diabetic ketoacidosis, renal failure, sepsis and more. Respiratory Therapist: RT’s manage the respiratory equipment in the various Critical Care Units. They assess and regulate ventilators and deliver breathing treatments according to physician's orders. Registered Pharmacist: Trained in recognizing drug interactions and side effects of complex medication regimes, the ICU pharmacist pays close attention to these details in the care plan for this patient population. Registered Dietician: A registered dietician oversees the nutritional aspect of the critically ill patient’s care whether the mode is oral, tube feeding or total parenteral nutrition (TPN) via a central line. Case manager: This RN is BSN prepared and credentialed in the specialty by the American Case Managers Association. Working with the patient and family to coordinate communication between healthcare providers involved in the patient’s care, assisting with financial and other administrative concerns and initiating the process of planning for discharge and follow-up care are responsibilities of the case manager. Physical Therapy: PT’s treat patients to limit and restore lost physical mobility and function that has developed during their acute illness.